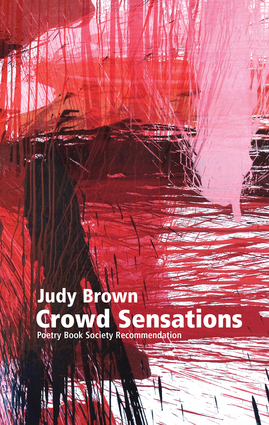 Judy Brown's new poetry collection, Crowd Sensations, showcases her subtle and dazzling style. A poet whose work is inspired as much by thoughtful speculation and metaphysics as it is by personal experience and relationships, Brown's poems surprise and delight at every turn. A central theme is the contrast between the city and the countryside. As well as spells living in London and Hong Kong, the author's recent residencies at the Wordsworth Trust in Grasmere and at Gladstone's Library in North Wales have provided key moments of inspiration. Her skill at paradox is evident in poems of unsettling intimacy, such as 'Poem In Which I Am Not Shortsighted' alongside poems of uneasy domesticity such as 'On The Last Evening We Watch Movies in Bed'. There is also some quiet, edgy humour in 'Poem in the Voice of a Dead Cockroach' and 'Was this review helpful to you?'. Judy Brown was born in Cheshire and studied English at the universities of Cambridge and Newcastle-upon-Tyne. She is now based in Wirksworth, Derbyshire, working as a freelance writer, and tutor. During 2013 Judy was Poet-in-Residence at the Wordsworth Trust, at Dove Cottage in Grasmere. Her first book, Loudness was shortlisted for the Forward and Aldeburgh prizes for best first collection.